With the arrival of Windows Server 2016 and Windows 10, Microsoft has introduced a new cool feature, very interesting for anyone who want to do remote tasks with virtual machines. PowerShell Direct allows IT admins to run PowerShell sessions inside a virtual machine from Hyper-V in a direct mode, without networking or similar. This means you can invoke a script also if the network is not available; or whether the hosts are separated from server/clients or there’s no way to open a remote session of PowerShell due to security policies. For this reason, PowerShell Direct is a “good to know”. To open a new remote session, use the command Enter-PSSession -VMName yourvm – as shown in figure 1. 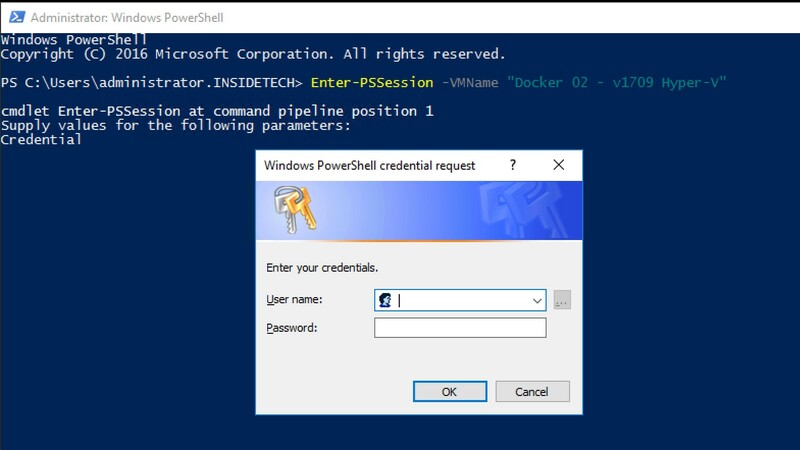 Once you are inside the session, you are able to work into the virtual machine and run PowerShell cmdlets in the same way of local, this means that you can use the PS Modules installed; as shown in figure 2, we can use docker commands without problems although the role is not present into Hyper-V host. NB: Keep in mind that all the connections based on Enter-PSSession are temporary and this means that if you close the window, it will be necessary to enter again the credentials. The performance behind this task are very interesting because thanks to the VMBus, we can jump all the drivers and the layers to allow the communication. The result is an high speed copy process, but don’t forget to consider what kind of file you want to transfer and also the VM performance (a .vhdx file located into an SSD is much faster than a file located on a HDD). PowerShell Direct allows IT admins to execute and automate the management tasks without the requirement to interact with operating system via GUI.